air or electric power. The unit interfaces with existing electric or pneumatic machine controls, and is available in either right or left hand configurations for easy placement and installation. 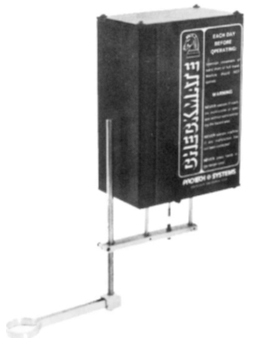 The Checkmate can also be integrated into foot treadle machines using the optional actuator conversion kit. Checkmate’s Light weight aluminum wand closes the point of operation with a downward motion on actuation of the operator’s trip control. Should the gravity-completed fall of the wand be interrupted at any point short of full travel, the Checkmate’s circuitry will remain “open” and fail to make the logic necessary for completion of the tripping signal. Removal of the interruption and reactivation will permit completion of the “single shot” tripping signal circuit and allow subsequent stroking of the machine. If the optional “contact” feature is selected “on”, the wand must additionally make metal-to-metal contact with the part in order to initiate the single shot circuitry. If contact with the part is not made the tripping logic is not completed. The action of the wand is extremely rapid and does not adversely impede production. The actual time required for the Checkmate to do its job is less than a second, and the wand returns to its “up” position after release of the operator station just as quickly. The unit is easily adjusted to accommodate any fixture, tooling, or changes in the profile of the workpieces. The Checkmate is easily installed on most machines. The rugged, all extruded aluminum enclosure mounts with just two bolts to either a customer-provided fabricated mounting or the optional “universal” mounting bracket. Once mounted, the unit may be adjusted for “side to side” or “bottom” of wand stroke by means of a single allen tool. Further adjustment of the wand may be made by forming the wand to fit a special application. The standard adjustable wand is designed for quick and simple allen/hex wrench adjustment when requiring set up changes. 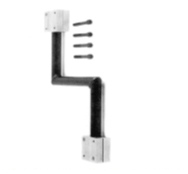 The optional “universal” mounting bracket provides greater adjustment capability through vertical height and axial/swivel placement of the Checkmate enclosure and wand assembly. Interfacing the Checkmate with the machine controls is simple. The electric Checkmate requires a 110-120 VAC power source and two-wire interconnection with the machine’s 110-120 VAC controls which, in turn, will interface with the electric hand or foot controls. The pneumatic Checkmate requires the same power source and interfaces with any pneumatic hand or foot control. Pneumatic units are supplied with a pressure sensor and solenoid valve for this interface. All units require an air supply source. All standard Checkmates feature a maximum protection stroke of 4”. This stroke is infinitely adjustable down to one inch, requiring only one allen tool and taking just a few seconds to adjust. Should the machine to be fitted with Checkmate protection have a purely mechanical tripping system, PROTECH can provide an actuation conversion kit for fast, reliable and safe activation of the clutch control. The conversion can be for either air or electrical operation for best-suited application. Anti-doubletrip circuitry; successive stroking of machine requires intentional multiple operator actuation of the tripping control. Anti-tiedown circuitry prevents wand from being tied down in closed position; wand must complete its intended cycle every time. Optional metal-to-metal wand “contact” tripping logic with supervisor “off-on” key, selectable by user at time of setup. Self-checking circuitry assures reliable operation on every stroke. A Checkmate internal malfunction will preclude machine operation until corrected. 10 Amp rated 110-120 VAC output for high reliability and long life with “single shot” solid state output logic. Wand stroke is infinitely adjustable to a maximum of 4”. Adjustment of wand takes only a few seconds. Electric models interface directly with any 110-120 VAC machine control and can be adapted to others. Simple two-bolt mounting to machine or optional “universal” mounting brackets. M Metal-to-metal “contact” logic with supervisory key “off-on” switch add “M” suffix to CHECKMATE Model Number when selected. “Universal” Z mounting bracket and clamp assembly.